As a runner and triathlete, having a good anti-chafe product is key. There is nothing worse than running or biking with chafed parts. Trust me. I know from experience. I still have a mark under my arm caused by chafing a year ago. Yikes! Meet Ruby! 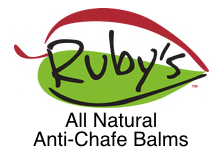 It’s an all natural, sweat resistant, lightweight and moisturizing anti-chafe balm. I was really excited to try Ruby’s because of the fun packaging and their ‘rhymy’ tag line; ‘Motion Potion for Every Notion’. I was also excited because they use all natural ingredients; sweet beeswax, olive oil, calendula flower, benzoin tincture and lemongrass, which I love. Coincidentally I had just started marathon training and was testing out new sneakers and sports bras, so the timing of this product was perfect. I knew I had to lube up well to prevent chafing and blisters because I was wearing new fitness gear. I first used Ruby’s on a 7 mile run in freezing cold temps. When I first applied the lube I loved how smooth it was. It glided on so easily that I probably over applied. Then there’s the smell. Oh my goodness. It has a fresh clean lemony scent that smells so good. I felt no discomfort on my run even though I was wearing a couple layers. That’s a good sign. After my run, I checked my body for signs of chafing or blisters. Nothing. The next day, I tried using the product for my indoor high intensity Kettlebell Kickboxing class. If you know me, you know that I sweat buckets within minutes of exercising. So if this lube is sweat resistant, my body will really put it to the test. After 60 minutes of doing this high intensity class, I checked my body for signs of chafing or blisters. Again nothing. It’s safe to say that I love this product and definitely recommend it. The good folks at Ruby’s Lube gave me a few samples so I’ll be giving them away starting tomorrow!